This entry was posted on February 2, 2018 at 4:29 pm and is filed under Agitprop, Bike stuff. You can follow any responses to this entry through the RSS 2.0 feed. You can leave a response, or trackback from your own site. I, too, “love me some trails” and bagged (trying to sound younger than I am!) 1 1/2 hours on some clear/icy/snowy ones here today in the Bibleburg environs. Great therapy to be outdoors in, atleast up here, 48 degree weather, eh, mi amigo? Doesn’t actually matter to me where they lead. They all lead to kid-like fun and renewal. So…..as a nearly 71-year old who has taken up MTB’ing in the past 6 years to avoid the “4-wheeled nuts” of road cycling around here, may I humbly suggest you ask your sources of 2-wheeled vehicles to provide you a hard tail or full-suspension “MTB” vehicle for review? My physical and mental and emotional health are always superchargeded by a good challenging MTB ride. My two cents……agree with the Nunes memo link….enjoy some Hatch chiles when able……keep the home fires burning. JD, the Adventurous Cyclists would like to see me on a double-boinger. To them it would be like watching J. Fred Muggs playing the piano with Steve Allen on the “Today” show. Yep. I too took to the singletrack today, but with the double boinger. The trails out back behind Chez Bombtown are twisty and rocky and a lot of fun with front and back spring rates but not much fun with a hardtail. Brett Stephens’ editorial in the NY Times (“Devin Nunes’s Nothingburger”) was a hoot. K, these trails are beaucoup swoopy and flowy, for the most part. There are a couple that can beat on you pretty badly if you’re riding rigid, but I’ve found workarounds. The newish 505 trail was fun to ride on a cyclocross bike exactly because it was tight, twisty and occasionally rocky. I think I’d have had trouble working a fat-tired machine around it, if only because I get so little practice on one. I should take the Jones or the Co-Motion up there one of these days. Both are rigid, of course, but they also have fattish tires and disc brakes. The trails up this way are more like these pics. 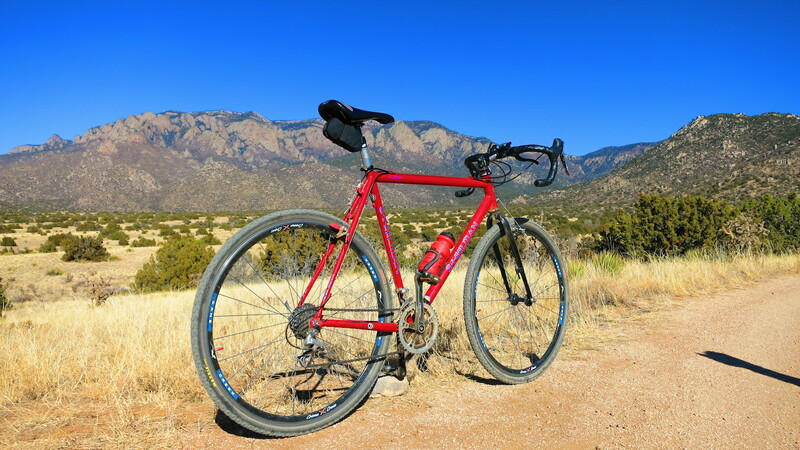 I also had some dirt time yesterday on the Niner, a proper steel hard tail 29″ mountain bike. When I saw the picture of that beautiful Steelman, with the bars lower than the seat, the word that came to mind was Jones. I keep my steering columns longer these days to show off those beautiful carbon spacers. The memo was a joke. It is funny to watch POSPOTUS (thanks Libby) and his lackeys trying to dodge Mueller. Well, Pat, the bars are only a little lower than the seat. These Eurocrosses are old racing bikes, and in my golden years I find the stems are too long and don’t have enough rise. Also, the 42cm bars are too narrow and the reach and drop too long. One of these days I plan to spend some cash on the yellow Eurocross — lose the 8-speed Shimano 600 STI for bar-cons and aero levers; drop the chainrings to 46/34, and go to a 90mm stem and 44cm bars. Yep. I’ve sawing down the stem length and raising it. Especially after 2005 with that disk herniation. Now I have plenty of other excuses as well, mostly involving encroaching geezerhood. All three bikes are 60mm by 115 degree stems, one Bontrager and two Salsa. The Soma ES has 3 large spacers under the stem. I feel old. I was thinking “that’s a nice-looking bike” just for that reason. Don’t you find those shorty stems make for some twitchy steering response and not enough weight on the front wheel? After 3 decades in the bike tour biz I can pretty much predict who the best descenders will be based just on stem length and height. Good morning Larry. My Soma ES steering is a little twitchy. And the riding position is a little more upright than my touring bike. Looks like I need to experiment a little. Thanks for the tip. HELP!! !…I’m stuck in North Mississippi,(Spokanistan,Wa. ),,surrounded by, Rump Fascists driving ’73 Ford P/U’s with Conferderate Flag Decals!!! Just put a case of PBR, clearly visible, on the rear rack of your bike, and you will be safe from being hit from the rear. And, always wear a “Get ‘er Done” jersey for insurance. “Spokanistan.” Hah. I like that. I haven’t visited since 1982 or thereabouts, so I can’t address the local fascist fauna with any credibility. You have a good writer up that way, Jess Walter. Ever read anything by him? Oh my gosh, I can’t believe I just had to defend your good name. I deal a little on FB and belong to a page called Cycling Over 50. One of the guys said he felt insulted by the Old Guys that get Fat in the Winter cartoon from back in the 80s so much that he quit reading the magazine. I told him that I didn’t think the artist meant to insult anyone and that it was just tongue-in-cheek humor. Not sure if he got it or not. That FB has over 12,000 viewers, so I just went ahead and posted the link to the Voler page in case anyone was interested in a jersey! Geez, never underestimate the ability of some people to be outraged I guess? I remember some of these types calling for an “intervention” for Greg LeMond when he started to look like a normal US citizen instead of a super-lean pro bike racer and even Alberto Contador joked when he retired that he’d gain weight and people would make fun of him. Maybe it’s time to ditch “in Winter” from the Fat Guy’s jersey? Sharon, sounds like this dude needs to lighten up. Aaaaaaaahhhhh ha ha ha ha ha ha ha ha ha ha ha ha ha ha ha ha ha ha ha ha! I still got it! Bada boom, bada bing, etc. Alas, as you note, some folks never get it. As I disclosed in my book, “The Season Starts When?”, the Old Guy Who Gets Fat in Winter is me. “I took up cycling to lose weight after a friend told me I had more chins than the Hong Kong phone book,” I wrote. It worked. I had been inching up toward 200 pounds, thanks to a desk job, a lousy diet, and a genetic tendency toward sloth and torpor (the Irish didn’t learn how to walk upright until the English invented the wheelbarrow). Now I weigh 162, which feels about right. And I keep Fatso around to remind me of the bad old days. He still pops up now and then in my “Shop Talk” strip in Bicycle Retailer and Industry News. In fact, I woke up thinking of working him into a strip on the #MeToo movement. Something about him not being able to get sexually harassed in a Turkish prison. I have weird dreams and consequently a lot of hate mail. But thank you for taking up the cudgel on my behalf. “Brittle spirits,” as Dave Chappelle calls them, are among the many reasons why I no longer have a Facebook account. The Twitter account remains operational, but idle. 162! You weigh 2 pounds less than I do, and I’m closer to the ground. Pretty soon you will have to run around in the shower to get wet.